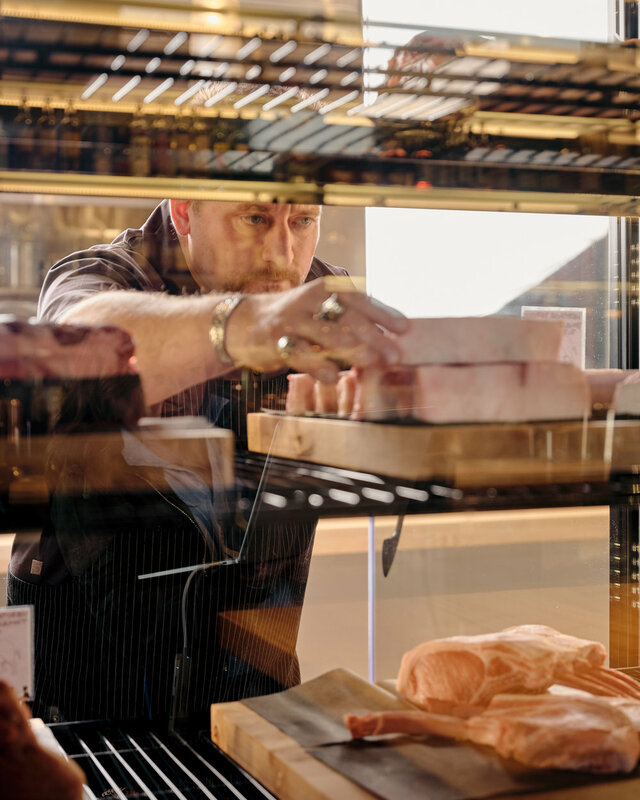 Clean, contemporary design meets old-fashioned quality and service at The Butcher Shop, where customers can ask for cooking tips, learn about the origin of various meat cuts, and purchase tools of the trade. Head butcher Guy Crims personally curates a wide variety of products and cuts, including A5 Wagyu beef from multiple prefectures in Japan, dry-aged domestic USDA Prime beef and Reserve grade Imperial Wagyu beef from Nebraska, domestic Heritage Kurobuta pork from Iowa, and lamb sourced from a fourth-generation Basque farm, Superior Lamb Company. One of The Butcher Shop’s signature features is the availability of Japanese A5 Wagyu beef. The shop is the exclusive retailer of A5 Wagyu from Ono Farms in central Japan and the only certified Kobe beef retailer in San Francisco. Standard meat cuts are available on a daily basis, but customers may request a custom cut of any thickness or quantity. At night, the intimate space may be rented for private functions. Beginning in March, The Butcher Shop will offer daily, limited-availability “butcher’s choice” sandwiches to go. In 2017, Crims was invited to tour Japan with the Japanese Wagyu Beef Committee—the only non-chef included on the tour. There, Crims met Omakase Restaurant Group co-owner Jackson Yu. Chef Yu enthusiastically introduced Crims to his business partner Kash Feng, who was in the early planning stages of a Wagyu-focused butcher shop and restaurant concept slated for a space at One Henry Adams. As plans started to coalesce, Feng tapped Crims as the master butcher for both the restaurant and butcher shop concepts. As the master butcher for the neighboring Niku Steakhouse, Crims will work side by side with Executive Chef Dustin Falcon to ensure quality and consistency for the restaurant’s meat program.